In the year 1482 - ten years before Christopher Columbus sailed across the Atlantic Ocean, a contemporary of Leonardo Da Vinci produced an Atlas of the known world. This map maker's name was Francesco Berlinghieri (1440-1501). He called his Atlas the "Geographia", which he published in Florence Italy. His Geographia was based upon a geography first created by the cartographer Claudius Ptolemy of ancient Alexandria Egypt (2nd Century AD). In the Geographia, Berlinghieri included a composite map encompassing all of the known territories of the Earth which were included in his atlas. This world map was projected over a spherical-like grid which depicted 180 degrees of the Earth's surface. This projection was what was known as a "Ptolemaic" projection of the Earth's surface. This projection started with a prime meridian situated just behind the Fortunate Islands in the Atlantic Ocean at 0 degrees in the far west, and continued 180 degrees eastward to eastern Asia. Several different versions of Berlinghieri's world map were created like the one contained in his "Gegoraphia", which had a printed published date of 1482. These other world maps were virtually identical to the one printed in his "Geographia", except for one. This peculiar world map featured a large island in the same place where the Fortunate Islands were located in all his other world maps. 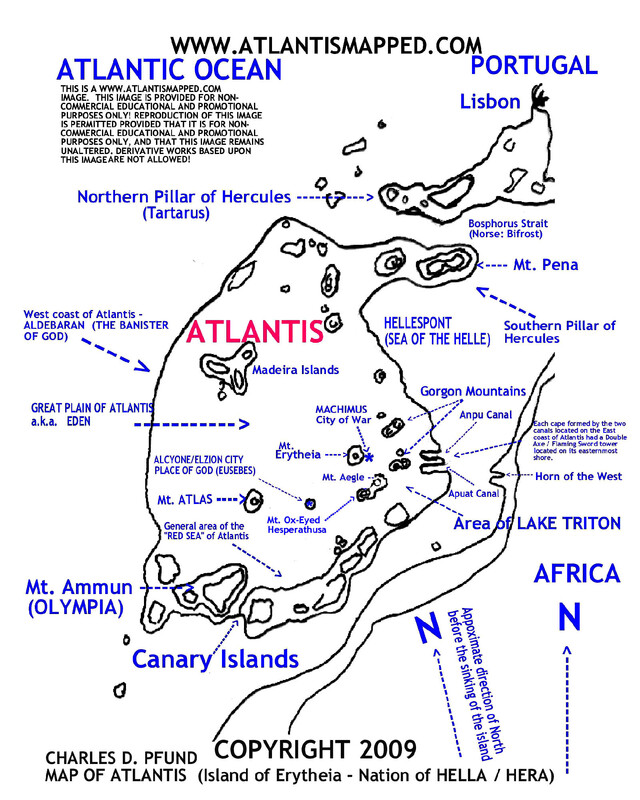 The Fortunate Islands in this odd map were shown as a series of large mountains on a mysterious island which had been depicted as being off of the west coast of Africa in the Atlantic Ocean. A much clearer close-up of this area was created by another period map maker that was virtually identical in design as the irregular Berlinghieri map. 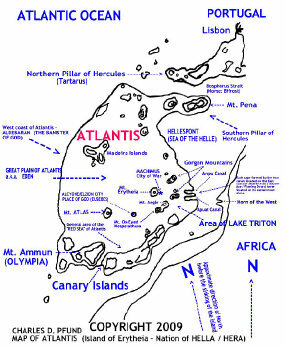 Below is this map of western Africa and the Fortunate Islands, beside a recreation of Berlinghieri's mysterious island incoporated into this same map.